Browse 41 categories of problem-solving, spa information. askalanaquestion.com . . . problem-solving help is just a click away!!! The images below will change randomly, if this page is refreshed or revisited. Click The Images . . . for more product information!!! askalanaquestion.com . . . more free information is just a click away!!! The common spa and hot tub topics have been broken down to several broad categories. Each of these categories covers a different area of interest, in the "Ask Alan" archives. Listed below, are the specific topics covered, in that section. Click on the topic, of particular interest, to go to the appropriate subject matter. Because the categories and spa care subjects are not always clearly defined, you might want to browse through some of the related topics. The Website Table of Contents can be useful, in locating information of particular interest and can be accessed, using the Spa Topics Link, on top of every page. Enjoy the journey! pH and Total Alkalinity: factors that go hand in hand. pH is always more important. Calcium Hardness: hard or soft spa water conditions can lead to different problems. • The Magnetic Water Conditioner Store: solves common scale & hardness problems. Stain Prevention, Removal and Treatment: eliminate metals, discoloration and stains. Minerals and Well Water Problems: can cause surface stains and water discoloration. • Stain Prevention, Removal and Treatment Store: solve metals and mineral problems. Spa Water Testing: important for proper water quality and sanitation. • Electronic, Digital Pool Water Testers: there's a ColorQ Test Kit, for every spa need. • Electronic, Digital PockeTesters: the easy way to test for Salt, TDS and more. • Professional Water Analyzer Labs: the right test labs, for professional use. • Specialty Test Kits: individual testers for a variety of spa water test factors. • Test Strips: a complete line of test strips, for homeowners to professionals. • Drinking Water SpinTouch Lab: this advanced technology can test drinking water. • Replacement Test Supplies: replacement supplies & reagents, for LaMotte Products. ColorQ Daily Testing Log - a printable page, that you can use to log your test results. Miscellaneous Spa Chemicals: various types or lesser known, useful chemicals. Langelier/Saturation Index: calculations that help control corrosive or scaling conditions. Ryznar Stability Index: calculations that aid in treating & avoiding corrosion problems. Metric Conversion: converting English type units. Calculating Spa Volume: simple to figure and easy to follow calculations. Calculating Interior Surface Area: easy to do, when you have the right information. Spa Chemical Safety: safe chemical usage is important to enjoy the hot water experience. Cloudy Spa Water: detracts from the water's appearance and diminishes the enjoyment. • Nano-Technology Store: a 21st Century way to improve water clarity. Spa Filter Problems: one of the keys to optimum water clarity and quality. Algae, Mold and More: the result of inadequate sanitation or maintenance practices. Spa Foaming: something that should be controlled and eliminated, for proper sanitation. Slime and Odor: usually caused by poor water sanitizing and/or improper water chemistry. Rashes and Irritation: solving & avoiding problems, usually resulting from poor sanitation. Chlorine: most commonly used in spas in the dichlor granular form. Chlorine Generator, Salt: a better way to chlorinate. No measuring, handling or storage. • Salt Chlorinator Store: a variety of salt chlorine generator options, for all types of spas. Bromine: a very popular spa water sanitizer. Biguanide: an alternative spa water sanitizer. Ionizers: sanitizes water utilizing metallic ions. Mineral Sanitizers: sanitizes water with metallic ions. Ozone Generators - Ozonators: the power of Ozone (O3). UltraViolet (UV) Sterilizers: kills microorganisms, as the water passes through the unit. Shock Treatment: destroys contamination and wastes, by boosting the oxidizer levels. Alternative Spa Sanitizers: exploring other spa sanitizing choices and combinations. Leaking Spa Problems: suggestions and solutions to help find and repair that leak. Sealing & Repairing Spa and Swim-Spa Leak Directions: how to use Fix A Leak. • The Fix A Leak Store: how Fix A Leak seals many commons types of spa leaks. • Fix A Leak Magasin en Français: Instructions Complètes en Français. • Fix A Leak Shop auf Deutsch: Anleitung Komplett in Deutsch. • Fix A Leak Almacenar en Español: Instrucciones Completas en Español. Spa Leak Detection: locating and fixing spa leaks, while minimizing any damage. Swim Spas - Swimming endlessly in place and getting a varied aquatic workout. Floatation Tanks: a relaxation experience, based on soothing, complete isolation. Opening and Closing: the start up and the shut down. Spa Maintenance: how to do to some common tasks or make repairs. • Crack Repair Systems - Repair Structural Cracks in Pools, Spas, Fountains and more. Refinishing Spas or Swim Spa: refinishing using a Hybrid-Epoxy coating. • Hybrid-Epoxy Coating Store : using Ultra Poly One Coat, for better results. Spa Heating Problems: things to check and how to avoid heater damage. Kid's Spa Problems: some factors to consider, but "kids" are "kids." Miscellaneous Spa Problems: various hard to categorize spa topics. 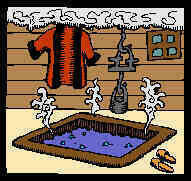 Hot Tub Liner Problems: stops leaks and protects the wood from the damaging effects. Learn . . . More About Spas!!! More Spa and Hot Tub Information . . . are a click away!!!!! Browse through information from some of the leading Spa Product Companies and access links to their websites. More information is just a click away. Browse through feedback from pool and spa owners, pool specialists and website sponsors. We can't add them all, so only a sampling have been chosen. We do get lots of letters. For locating information or products, use this alphabetical listing of the entire website's content. A quick way to locate the product or information. On a daily basis, we'll try and add a brief, helpful pool or spa tip and retain the most recent posts. We hope that you'll find the information and links, both seasonal and helpful. Learn more about hundreds of pool and spa terms. Everything you might need or want to know, about pool or spa terminology. Helps you become better informed. More Spa and Hot Tub Information . . . is just a click away!!!!! To ask a question, use the "E-Mail A Question" Link, in the banner, at the top of every page. Your privacy will be guarded. Please include your name, city, state and the specific details of the problem or question. All questions are answered in a timely manner. Browse through a list of links to some suggested websites in the pool and spa industry and more. You might just find the right link or whatever you're looking for! There are also links, throughout this website, to direct you to additional problem-solving or product information. Read some biographic materials about the creator of this website. More than 40 years of experience, in the pool and spa industry and a background, as a chemist, has lead to this website's development. Tens of thousands of pool and spa problems have been solved. Any Company wishing to have their Company or Products included in this website, should click the link, directly below, for more information on Website Sponsorship features. If you looking for a specific product, this alphabetized listing. from A to Z, of all of the items, for sale on this website, is sure to help. Otherwise feel free to browse or use the Search Bar, near the top of every page. Maybe you'll surprise yourself. Better Information and Safer Shopping. . . are a click away!!! Sometimes a unique or hard to find product can solve a pool or spa problem or simply make things easier. You'll find interesting products, that you might have never seen before, and others that help you save time and effort. Take a look. Surprise yourself. Finding new Pool and Spa products is always fun, because you never know what you will find. You might find something entirely new or a product that you never knew existed. No matter what, taking a quick look just might help solve a problem. Why pay full price? This is the place to start. You will find ColorQ all-digital Water Analyzers on sale, as well as a variety of other, interesting pool and spa products. Your purchasing information is protected, with SSL encryption, on our secure website. Browse through a variety of Spa and Hot Tub products. You'll find products that will help you solve problems or make spa, swim spa or hot tub maintenance easier. You're bound to find something interesting, that you might not have seen before. On-line selling since 2002 - Safe and Secure!!! ** Most products can be shipped World-Wide. International and orders outside of Continental U.S. - see comments on the ordering pages.